Materials: Green marble Jasmine - painted steel - fluorescent paint - video support - audio - perfumed essences. Dimensions: cm 550 x 550 x h 370. Inscription on the projected video support: A “Campo di Fiori (Field of Flowers)” for Giordano Bruno. Heresy is a spontaneous flower that blossoms in a formal garden. Eliminate prejudices and discover the essence of liberty! 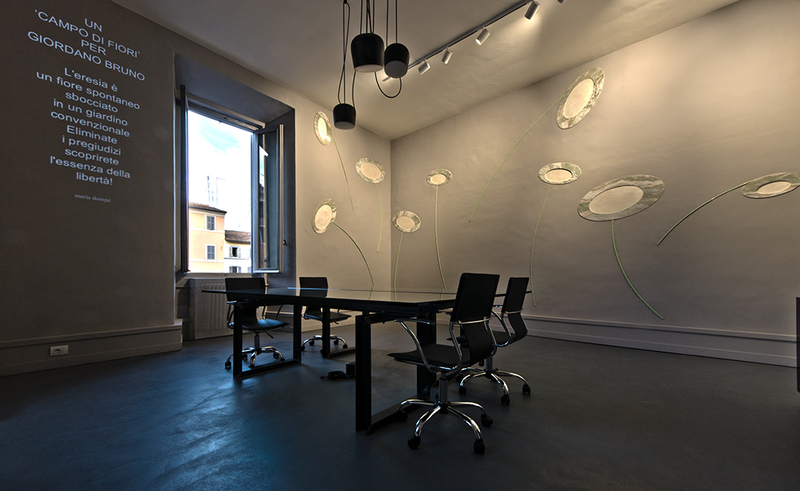 An office building in the historic center of Rome, inside a meeting room with a direct view of Piazza Campo dei Fiori and of that striking presence in the piazza: the monument to Giordano Bruno. Even though she had to work within a confined space, especially in comparison to her recent artistic experiences, this was a stimulating and exciting opportunity for the creativity of Dompè. She transforms the limited area of a simple room into a story of images expanding beyond the visual and, above all, the meditative confines. Only two walls to create an engaging narrative. A prospective approach, special and essential: a floral appearance by means of a thoughtful chromaticism, harmoniously balanced, all in an interior space which is experienced in a fluctuating expansion. 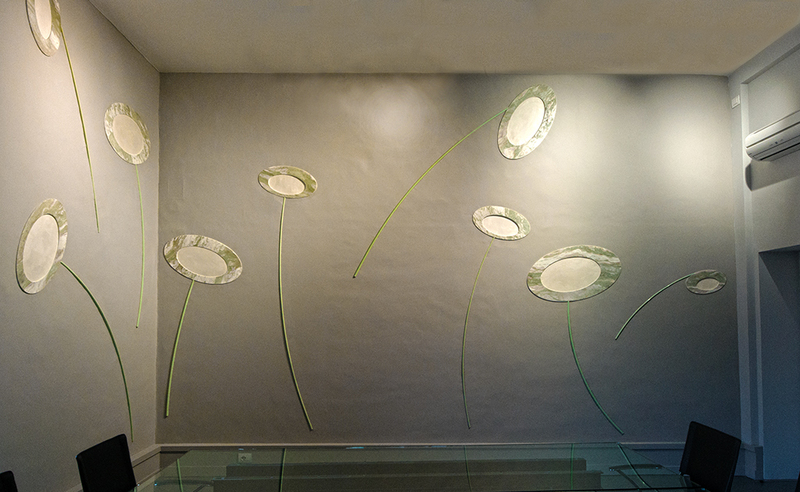 A dedication illuminated and enlightening appears in a part of the wall and a velvet-like sound accompanies the view, and the spreading perfume of essential essences completes the surrounding sensual experience of the work. Including the surprise of a nocturnal effect, poetic, imbued with a dreamlike atmosphere. The artist, with sensitivity and emotional involvement, renews the special ability to invoke the historical essence of space, to perceive that immaterial thread of memory that links the present with the past. Freed from every creative limit, or at least free to take from different artistic genres, Dompè reveals her usual passionate suggestiveness that arises from the intimate dialogue with thespace. 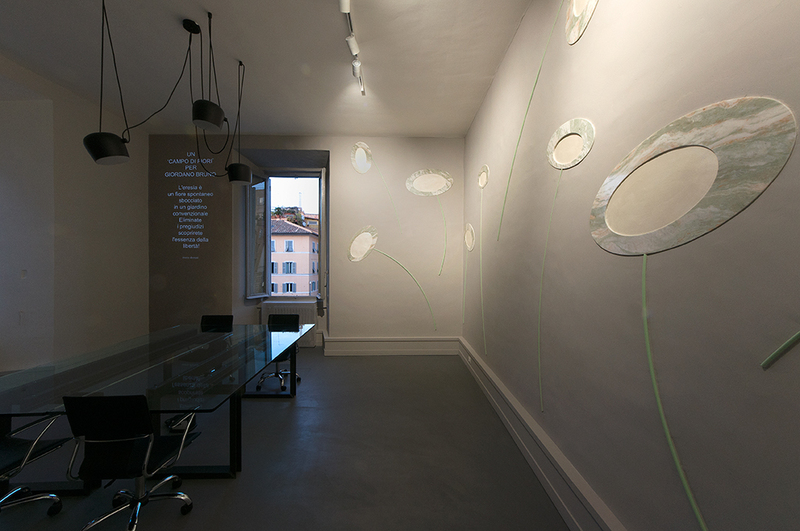 The inspired words of the artist for the dedication to Giordano Bruno (cited above) and for the presentation of the project (note below) summarize the creative implications of the work: Campo dei fiori (field of flowers): an urban homage to the tragedy of obscurantism. Giordano Bruno: a trampled freedom of expression. Connections between past and present between outside and inside, for a dedication to intellectual energy. A window opened to the past: reverberations of lacerating wounds for all humanity. Two walls: white pages for a story of images, evocative and visionary. Reflections that are aware of the freedom denied. Signs and similarities of luminescent chromaticism. Sensorial enthrallment for an emotional approach. A metaphor: the darkness illuminated by the intellect, until the connection with the daily life of the flower market. The sensory experience of the work comes through sight, sound and smell. 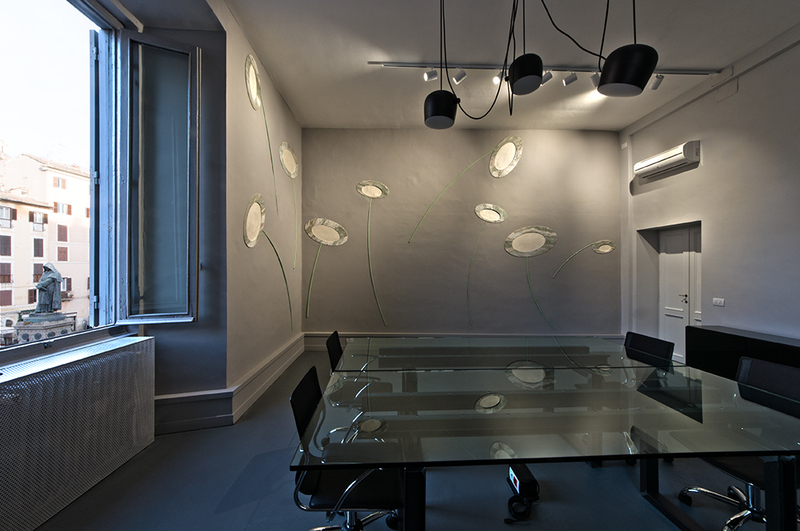 NATURAL LIGHT – illuminated by a simple natural source which reveals the essential linearity of the artistic design. The stone together with the accentuated chromaticism of the metal bars, includes two corner walls, creating a scenic and prospective frame that amplifies the perception of the size of the entire space. 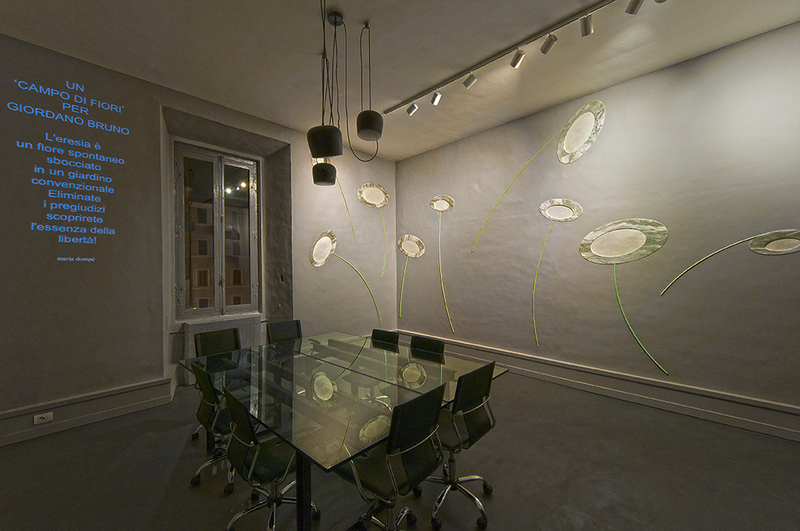 ARTIFICAL LIGHT – by using a dedicated spotlight, the work will light up with colors thanks to the targeted lighting. ESSENCE of Light – by using special fluorescent paints, even in complete darkness, the work will be partially illuminated with iridescent reflections.